Certain months of the quarter pay more for me. September is a pretty good payout month. October will be even higher. I am expecting over $1000 in October! But November will be a lighter month since I do not hold many companies that pay in November. 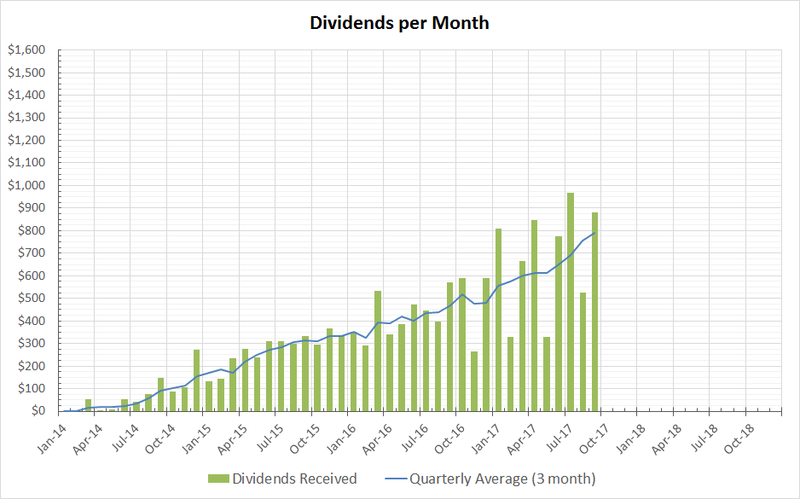 Since I continue to contribute every month to my portfolio, the dividends paid out on average every quarter should continue to increase as shown in the moving average line in the plot below. congrats on 880$ of dividend income, that's awesome. Not long and you crush the 1k per month on a regular basis. Your graph shows the steady path you're on and the power of dividend growth investing. - I'm in my year two of the journey to FI and absolutely happy with the progress. September Income will be just short of 500$ and projected annual dividend income about 3600$. When i look at your top payers in Sep like JNJ and PEP i know that these two companies have to end up in my portfolio, but it's difficult to catch them at a good valuation these days. Dam nice young! Great income. Crazy that you used to earn less than that already.. got to love the climb of dividend investing. Excellent work, YD. So many great stocks in your list of Sept. dividend payers. That dividend from O is impressive given that it comes in monthly. The dividend from V may look small, but it's nearly twice mine, so I know it's a sizeable position. The growth from V makes up for the smaller payout - it's all about total return. The chart reveals the steady income growth that every DGI investor is looking for. If you expect $1K in October, it looks like that will be your 1st $1K month... exciting! Congrats on the almost $900 total! Your big whoppers are some of the most stable companies, so congrats int aht area as well. Looking forward to your October! $800+ a month is some serious money. This was a big month for me as well. Keep it up. Almost $900 is awesome! And, wow!, that $53 a month in dividends from O is incredible. It's cool to see so much invested in Visa as well. They are a cash flow giant and one of my best longterm investments. They pay a small dividend but have tons of opportunity to increase it. I hope they are working on some sort of blockchain technology. Bitcoin won't hurt them, but the underlying technology might be a threat to effectively cut out the middleman, i.e., the authentication that Visa provides. What are your thoughts on that? Nice job. JNJ, O and D are a few of my favorite cash cows too. Those are some amazing results, all most 900$ in dividend. It's great that you mention the small start since I'm currently there and earning below $20. Inspirational to see where it can go! Congrats on the fantastic month! $880 is very impressive. Noticed CHD in their, it's one of my newest stocks. Adding little bit each month through Robinhood. Hope October is treating you well too!